Brisk walk through the basics! 25 February 2018, Shabad Surati Sangam Ashram, Moga: In easy to understand, and at the same time offering thorough insights Sadhvi Ji shared some of her experiences from her time spent amongst devotees and a variety of their perspectives. Well, journey and thus experiences are bound to be different, but the goal is One. And while we are at it, without doubt satsangas play an immense role in keeping our tank fueled up. How? Lets explore! Why be a part of satsanga? To charge battery! Because whether directly or indirectly, each soul seeks happiness, peace and power. And the very thing that keeps us from realizing that is the baggage we carry on our shoulders day and night. The baggage named, ‘a) Why this isn’t happening, b) Will this happen, c) Why that particular task didn’t end up a certain way?’ Our lives are bubbles of such negative thoughts. We are constantly worried about one thing after another. Each and every activity that we do is out of compulsion. But what if we could make a little shift, if we could do it all filled with joy and love; it would strengthen our life from every perspective be it physical or mental. Selfless love, i.e. surrender unto Guru’s command; why, because neither worldly relations nor the idols within temples that we bow to are to offer a clean and clear mirror. Earn as much as you want. But just keep your priorities set straight. 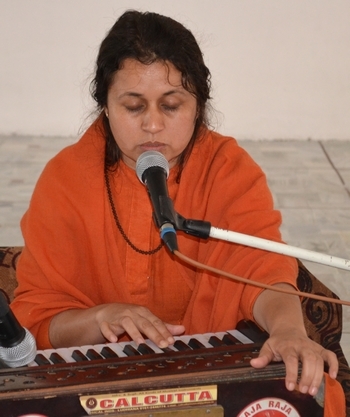 Consistently and persistently practice Guru-mantra! Don’t forget the real goal, i.e. the realization that I am not this body but the ansha (excerpt) of the divine, and so is the true for every other soul!